Regional high school budget pays for public education and facility needs every year for students in grades 9 through 12. The regional high school district committee took a hard look at a draft $22 million budget for fiscal year 2020 at its regular meeting Monday night, weighing options to keep the increase over last year’s budget to a minimum while still fulfilling existing obligations. High school finance manager Mark Friedman said the operating budget could increase by up to eight per cent over last year’s total of $21.1 million. But Mr. Friedman recommended a series of measures — to varying levels of enthusiasm from the committee — to lower the increase to closer to five per cent. “This year in particular is a budget that has a lot of priorities and a lot of things in it,” he said. The committee is due to vote on the budget on Dec. 18. On Monday Mr. Friedman outlined areas of significant increases, including health insurance costs which are up about $285,000. Contract-mandated staff salaries will increase $360,000. The school is responsible for the residential care tuition for two additional students next year totaling more than $341,000. The school is also adding four new positions, totaling more than $320,000. An overhaul to the food service system at the school will cost an additional $40,000. Mr. Friedman also recommended the committee budget about $196,000 for union negotiated salary increases resulting from the triennial collective bargaining process still underway. To soften the blow of added spending, one recommended strategy was to defer some payments toward other post employment benefits (OPEB). Post employment benefits mostly consist of health insurance for retired school employees, and the school is working to pay down its future liability in addition to covering existing retirees. “Our . . . recommendation on the other post employment benefits is to take a pause on our plan to, within three years, get to the normal cost level,” Mr. Friedman said. The school has committed to taking responsibility for the liability, aiming to hit a milestone in three years where it ceases to grow. “We would ask you to consider instead of having a three-year plan to get to the normal cost level, to consider that it becomes a four-year plan,” Mr. Friedman said. According to the most recent actuarial study, the school’s OPEB liability totals about $32 million. But some committee members were hesitant to put off OPEB. “It’s not going to be any easier next year. It’s going to be worse,” said Jeffrey (Skipper) Manter 3rd of West Tisbury. “This is money we owe,” he added. “It is our responsibility to take care of it, even in hard times,” agreed Janet Packer of Tisbury. “The OPEB obligation is something that we made a commitment to, and I think we should stick to it,” said Amy Houghton of Tisbury. In another cost-saving measure, Mr. Friedman suggested putting off funding for a the design of a new horticulture facility, taking $100,000 out of the budget. “We are recommending a pause on that project,” Mr. Friedman said. Principal Sara Dingledy noted that the horticulture program should be part of the general campus overhaul plan, for which a building committee was recently assembled. 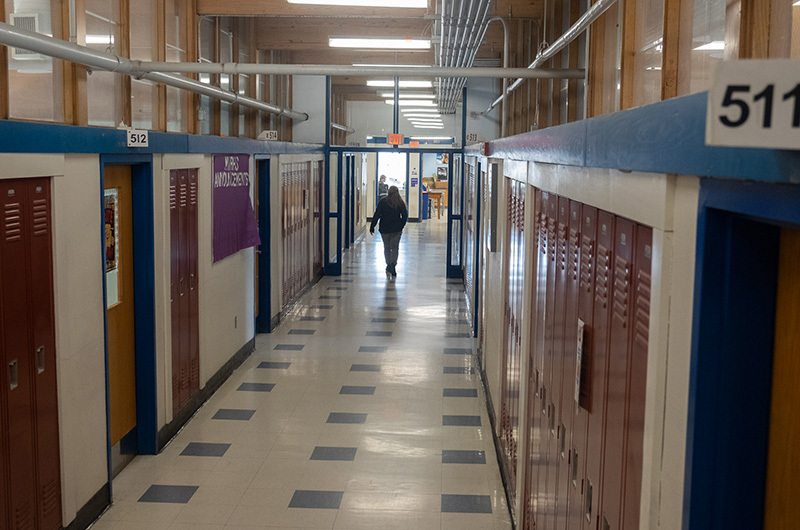 “It’s not punting on horticulture, it’s thinking about how horticulture can be better integrated into whatever the building committee comes up with as a larger design for the school,” Ms. Dingledy said. Ms. Houghton asked Ms. Dingledy to explain why she has so many people on her administrative team, which includes a dean of students, an assistant principal intern, and an assistant principal/career and technical education director, among others. “Seeing all of the cost for those [positions] together, it’s a significant portion of dollars. So just if you could speak to some of why you think you need to have all these administrators,” Ms. Houghton said. Ms. Dingledy said the administrative staff has historically been more robust. She added that additional administrators were needed to help tackle attendance and conduct issues. “Coming in I think there was a lot of expectation around what needed to be done around having a code of conduct, and having there be support in the moment for that,” the principal said. Speaking with the Gazette later, Mr. Friedman said he has worked with school administration to find areas to trim the budget and increase efficiency, including in administrative and supplies and vacancy savings. “We are committing to further restructuring to lower these expenses,” he said. The draft budget indicates that the school expects to receive some $2.7 million in revenue from the state and other sources. After a lengthy discussion, the school committee opted to put off a vote until the next meeting on Dec. 18 at 5 p.m. In other business, superintendent of schools Dr. Matthew D’Andrea informed the committee that the school was not accepted into the Massachusetts School Building Authority (MSBA) program. The program offers state funding support for school renovations and rebuilding. Mr. D’Andrea said the building committee is still interested in pursuing projects without the support of the MSBA. “My feeling is that we need to continue on. The feeling of building committee is the same,” he said. He said he would return to the committee for approval to go forward with warrant articles for annual town meetings next year to pay for a feasibility study. He said early estimates came in at $1.4 million for the design work. The school committee also voted 6-2 with one abestention to fund a new ESL teacher and an educational support person for the remainder of the school year using circuit breaker funds, state reimbursement funds for special education needs. Mr. Manter and Robert Lionette of Chilmark voted no. Ms. Houghton abstained.